Motto: "Heart of the Verde Valley"
Cottonwood is a city in Yavapai County, Arizona, United States. According to the 2010 census, the population of the city is 11,265. Cottonwood is located at (34.732145, -112.018565). 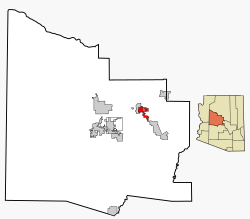 According to the United States Census Bureau, the city has a total area of 10.7 square miles (28 km2), all land. In the city, the population was spread out with 23.4% under the age of 18, 8.2% from 18 to 24, 23.3% from 25 to 44, 21.4% from 45 to 64, and 23.8% who were 65 years of age or older. The median age was 41 years. For every 100 females there were 86.9 males. For every 100 females age 18 and over, there were 81.4 males. The median income for a household in the city was $27,444, and the median income for a family was $37,794. Males had a median income of $24,308 versus $19,977 for females. The per capita income for the city was $17,518. About 8.9% of families and 13.5% of the population were below the poverty line, including 19.5% of those under age 18 and 11.3% of those age 65 or over. 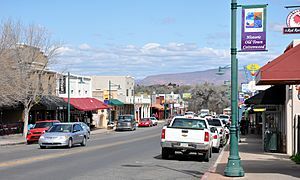 The Cottonwood Public Library is part of the Yavapai County Library Network and serves the city of Cottonwood along with surrounding cities including Clarkdale, Camp Verde, and Rimrock. Cottonwood, Arizona Facts for Kids. Kiddle Encyclopedia.